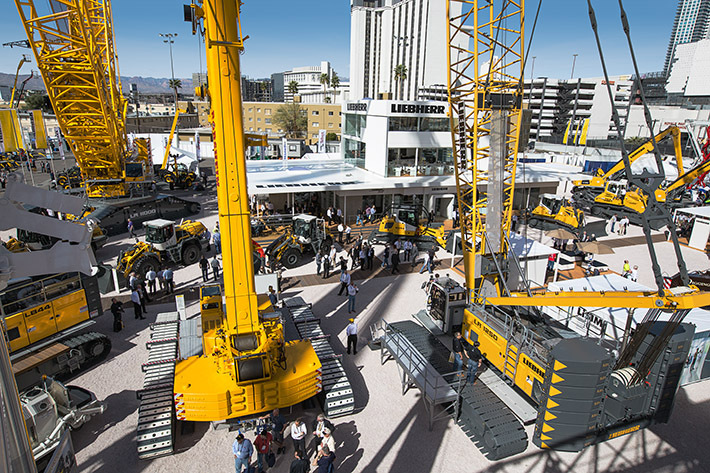 The Liebherr outdoor booth will be located at the Las Vegas Convention Center, Gold lot G4637. During Conexpo Liebherr will also showcase the new PR756 dozer which belongs to the new product range of Generation 6 Liebherr Dozers. The PR 756 has an operating weight between 84,430lbs – 90,720lbs and offers a 336 horsepower (250kW) (SAE J1349). It uses a Liebherr six-cylinder Tier 4 Final-compliant diesel engine and its blade capacity ranges from 11.67 – 15.30yd³. The high efficiency of its hydrostatic drive extends over almost the entire speed range maintaining adequate engine power at all times while fuel consumption is kept to a minimum. The PR 756 features an electronically controlled drive management with integrated ECO-mode setting. The cab design on the generation 6 dozers has been redesigned for improved visibility; the exhaust stack and blade cylinders have been repositioned to provide a clear line of sight to the blade. It comes standard with adjustable drive controls and a touch-sensitive system display. All routine service points on the PR 756 are readily accessible to one side of the engine making service more convenient, and like the rest of Liebherr equipment, it comes standard with LiDAT fleet management system. The VarioBase® variable support base developed by Liebherr as standard on the new LRT cranes makes an important contribution to enhancing safety. VarioBase® also provides greater performance and flexibility on site. Safety is also enhanced by providing greater comfort for the crane operator. For example, the crane cabin is 220 mm (8.5″) wider than other standard cabins on the market. It can be tilted backwards to provide greater comfort when hoisting loads to great heights. Clear, self-explanatory controls make the crane easy to handle. The 110 USt (100-metric ton) LRT 1100-2.1 has a 164ft (50m) telescopic boom with a “Telematik” telescoping system on which the various telescoping sections can be extended independently with a single cylinder and then pinned to the telescopic section above. The 30,800lbs. (14-metric ton) of counterweights ensure high stability. The lifting capacity of the LRT 1100-2.1 is around 15% higher than that of the 100 USt (90-metric ton) model which features 26,500lbs. (12-metric ton) of counterweights. The LRT 1090-2.1 features a 154ft (47m) telescopic boom. Its telescoping system consists of a two-stage hydraulic cylinder with a rope extension mechanism. This “flight” can hardly be put into words – you just have to experience it. Simply take a look through the virtual reality goggles and you will find a whole new world – from the trade show stand direct to the city, to a site about 1,000ft. (300m) in the air, immediately in front of the Liebherr 710 HC-L luffing jib crane. Using the game pad you can explore this 3-D world for yourself – take a look at the man-size hook up close, fly into the crane’s jib or through gigantic urban canyons and watch the traffic below – anything is possible. Using this virtual reality application, visitors can experience the crane in a whole new dimension, including different weather conditions and different times of the day and night. The Liebherr crawler concrete pump is particularly suited for applications in which pumping of the concrete is constantly being relocated around the building site. Maneuvering and operation of the crawler track-mounted concrete pump is effected via remote control. The series of Liebherr crawler concrete pumps encompasses three different models – the THS 80 D-K, the THS 110 D-K and the THS 140 D-K providing max concrete outputs of 93 yd³/h to 177 yd³/h. The engine has emission standard tier 4 final. Liebherr’s Components division presents various innovative components from the mechanical, hydraulic and electric drive systems areas in the South Hall 4, Booth #S84230. One of the main highlights is the hydraulic cylinder series-production range for pressures of up to 350 bar, which will be presented for the first time to the American market. Specifically designed for dynamic loads, this series of double-acting differential cylinders is suitable for mobile as well as in industrial environments in the pressure range of up to 350 bar, optionally up to 380 bar. In general, 20 different piston diameters between 3.94 to 8.66 inches (100 to 220mm)can be combined with two piston rod diameters and strokes of up to 90.55 inches (2,300mm) can be achieved. On the Components’ exhibition stand, visitors will also find the newly developed LH30VO axial piston pump of swash plate design. The medium pressure pump complements the existing product portfolio in the range of 280 bar nominal pressure and is suited for use in mobile machinery. The pump for all mobile applications with open circulation has a specific delivery rate of 45cm³ per rotation and is already available with two of the most common controls.